* APPLICATION TECHNIQUE: Swirl, Tap, Buff® * Doubles as an applicator for blush or bronzer when turned on its side. What is the difference between this brush and the full flawless application brush? Is it necessary to have both? The full flawless brush will give you more coverage. I use it on days when my skin isn't looking so hot, but I use the regular one most often. Can I use this brush with a liquid foundation? I don't think this brush would do a good job with liquid foundation. It is thinner and fluffier with less structured shape to it. I lost my brush for the mineral veil. Is this the best brush to replace it with? 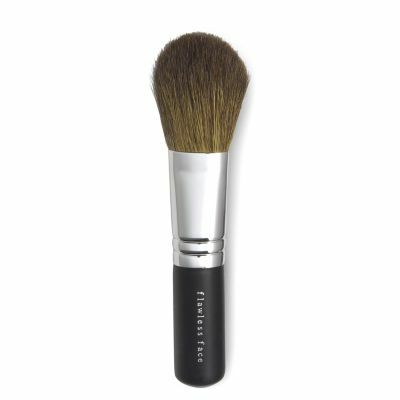 I use the Flawless Radiance brush to apply my mineral veil over my foundation. It gives me a really nice sheer wash of mineral veil, which is what I want. The goat hair of the Flawless Radiance brush is longer in length and less dense, so it picks up a lighter amount of powder.